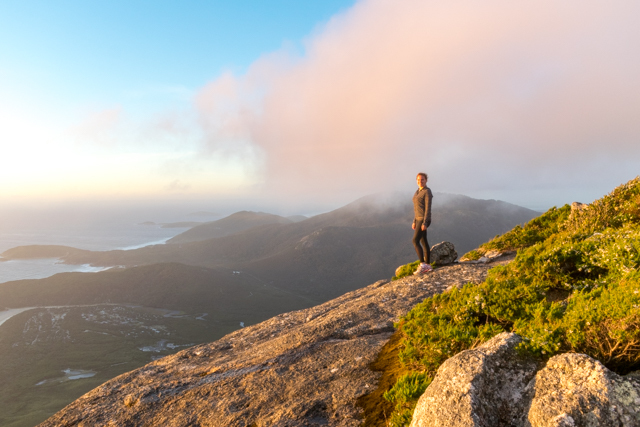 So you only have the weekend to visit Wilson’s Promontory National Park on Victoria’s south-east coast, but want to see as much as you can in this short amount of time. 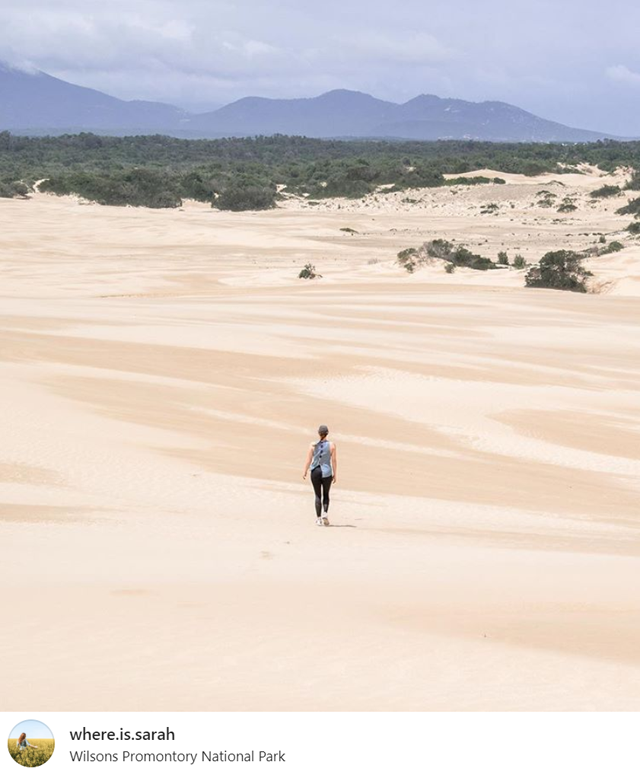 Covering over 50,000 hectares of land, the National Park is one of Victoria’s best kept secrets full of Australian wildlife, white sand beaches, boulder covered mountains and native flora. A three hour drive out of Melbourne, you want to make your time count! By planning ahead, you can fit a whole lot of sights and experiences into just a couple of days. Read on to find out how you can maximise your time in this diverse landscape complete with a multitude of attractions and accommodation options. Just as you enter the park, take a sharp right after the check-in booth and you’ll find the Stockyard campsite and carpark. From here, follow the signs for a 20 minute walk through bushlands and paddocks, up grassy hills and through tea trees until you reach the base of the Big Drift. Walk up the steep slope made of golden sand until you approach a single tree. This tree is very important to remember as it’s your way out. The Big Drift is a small yet vast desert sprawled with bushes, mountain views and an emu or two if you’re lucky. Have fun rolling down hills and getting lost (but not too lost!). Make sure you pack a hat, sunscreen, sunglasses, water and a sense of direction! If you’re camping, you want to get in early to find yourself a nice camping spot on flat ground, sheltered from the wind amongst the trees. There’s nothing like coming back after a long day to your bed already made. Grab yourself a bite to eat and pack some snacks for the next leg. If you’re staying in a cabin, check in is at 2pm. If you’ve brought a campervan there are two official designated campsites. You can find a little more information about the campsites here. 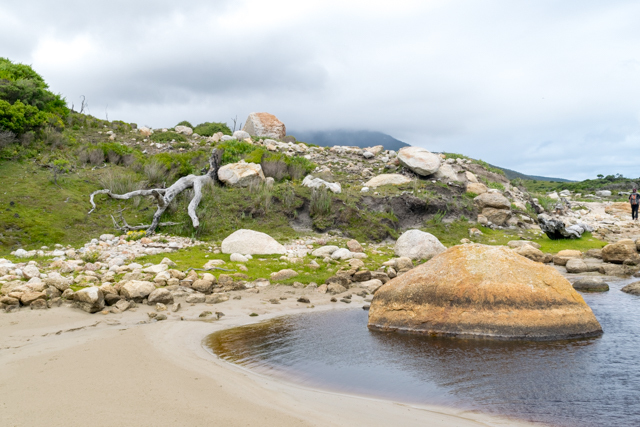 Tidal River has over 400 individual camp sites both powered and unpowered so you can generally afford to be fussy with your exact location. Don’t be too picky though as you can easily waste a lot of time finding the perfect position! Tidal river also has great bathroom facilities including hot water, as well as laundry facilities, dish washing areas and an outdoor cinema in the summer evenings. 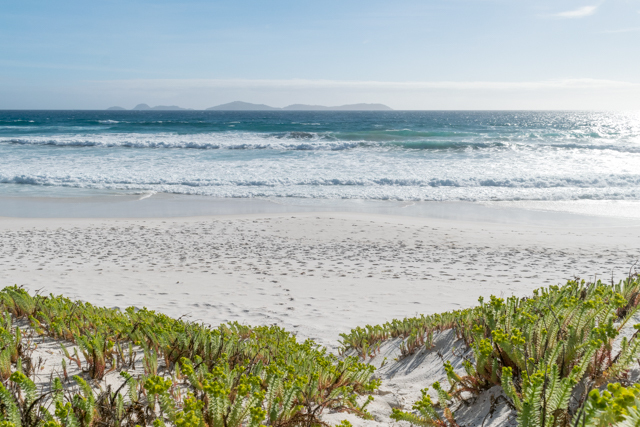 Winter or summer, you’ll have fun at Squeaky Beach. The round granite particles are so fine they squeak when you walk through the dry sand, hence the name! Embrace your inner child and have some fun! 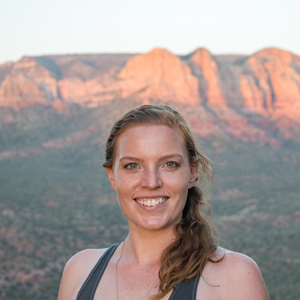 Fly a kite, go for a swim or explore the rocks. If you prefer a more peaceful time then bring a book and find a quiet space all to yourself to enjoy. At the north end of the beach you’ll find giant orange granite boulders sitting steady in the sand contrasting against the pure turquoise water of the ocean. 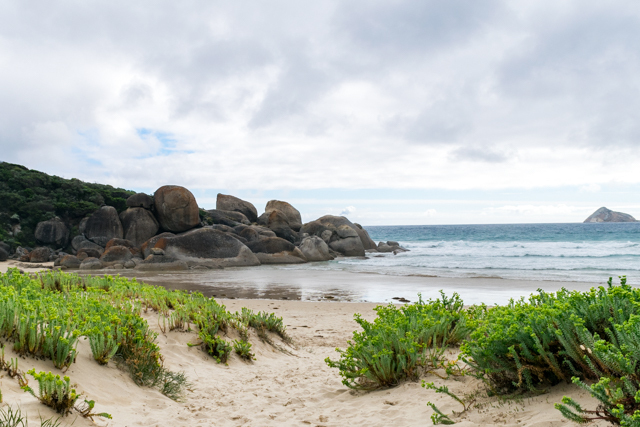 Squeaky Beach is accessible from Lilly Pilly Gully carpark, Picnic Bay and Tidal River via foot. The walk to Oberon Lookout is a gradual incline on the gravel management vehicle track and will take about an hour. Make sure you find out what time sunset will be at www.timeanddate.com. The start of the track is at the Telegraph Saddle car park. Once you reach the top, find a comfortable spot on the rocks and soak up the view. There is a chance you’ll be inside the clouds so bring an extra layer. Bonus points if you pack a picnic to keep you going until dinner. From the top you can find panoramic views of Tidal River, the various scattered islands just off shore, and the sun setting in the perfect spot over the horizon. Even in Summer this peak can get windy and cold, especially if the clouds are hanging low. The Prom it gets very dark very quickly, so take a torch with you. On weekends from November to April during the day there is a free shuttle bus to the car park as the road is closed off. Find out more about the bus and it’s running times here. After cooking a nice meal back at camp, grab a blanket and take the short walk from the campsite down to Norman Beach, find a spot on the sand and take in the sights. Keep an eye out for wombats along the way. 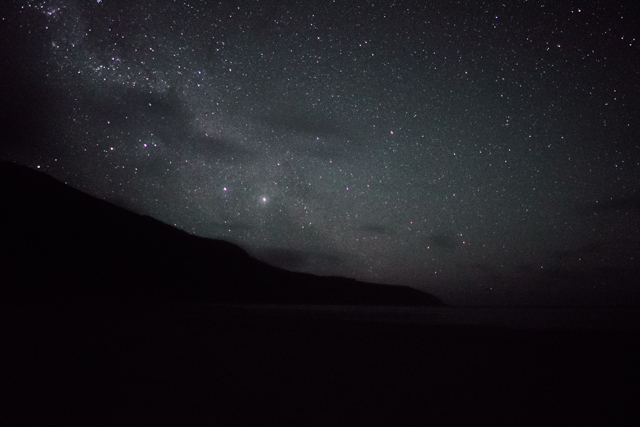 Wilsons Prom is a dark sky area as artificial light is scarce. 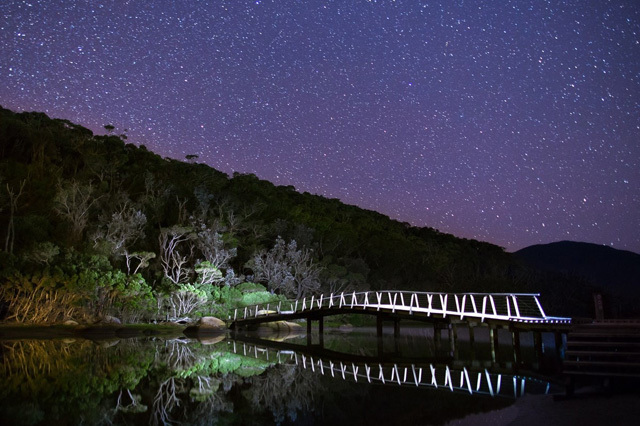 The stars here are some of the brightest you’ll see in Victoria. Download the SkyView app so you can locate the different constellations. After a good night’s rest, pack up camp and leave the car in the Norman Beach car park. Walk from East to West down the whole stretch of Norman Beach. If the tide is out you may get to witness the thousands of tiny purple crabs scuttling along the sand trying to find something to eat. Walk towards them and they’ll quickly dig a hole to escape, then look behind you to see them all reappear again. It’s a real Moses and the Red Sea moment! The walk to Grower Creek is around 6km and will take you approx. 1.5-2 hours one way. The creek is a picturesque lunch location but not so sheltered on a windy day. When walking keep an eye out for snakes as they like to warm up on the path and nearby rocks in the sun. On your way out of The Prom take a stop at Whisky Bay, just a 400m walk from the Whisky Bay car park (if your legs aren’t about to drop off). It’s a small, sheltered beach book-ended with oversized boulders. If you can manage to climb one they make for a great photo and place to enjoy a well earned refreshing beverage. 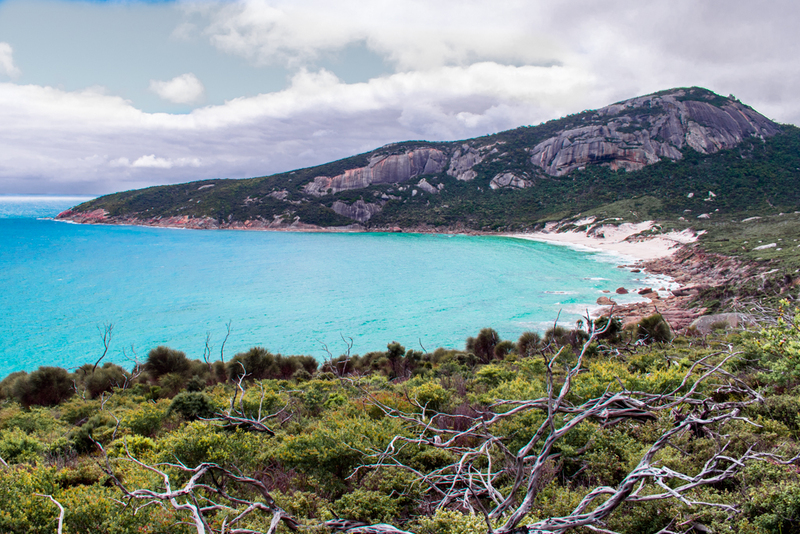 Prefer to take a guided tour of Wilsons Prom? Check out this day tour! Have I missed any must-see parts of the National Park? If so, comment below!